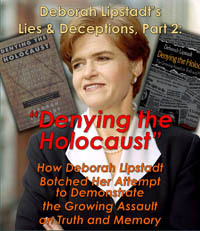 This video documentary is based on the book Bungled: “Denying the Holocaust.” How Deborah Lipstadt Botched Her Attempt to Demonstrate the Growing Assault on Truth and Memory,” which is available from the publisher's website or wherever books can be bought; check here for the best prices. Both this documentary and the book demonstrate that Dr. Lipstadt clearly has neither understood what the principles and methods of science and scholarship are, nor has she any clue about the historical topics she is writing about. She misquotes, mistranslates, misrepresents, misinterprets, and makes a plethora of wild claims without backing them up with anything. Among other things, she utterly fails to use generally recognized standards of evidence. Given the way she handles documents and data, it is clear that she has no interest in scholarship or reason. In fact, truth has been the antithesis of her enterprise. Rather than dealing thoroughly with factual arguments, Lipstadt’s book is full of ad hominem attacks on her opponents. It is an exercise in anti-intellectual pseudo-scientific arguments, an exhibition of ideological radicalism that rejects anything which contradicts its preset conclusions. Since she admits herself that her opponents’ motives are irrelevant, as an inescapable consequence, so is her book.